Is the subject matter right for poetry? Some topics lend themselves more easily to poetry than others. Some subjects refuse to be written as prose. While many stories can and will work as poetry, ask yourself if this medium is the best way to tell your story. If not, I’d advise you to take another approach. Is the protagonist right for poetry? 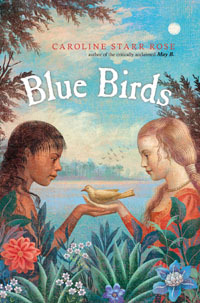 Often (though not always) verse novels are told from a very close first-person point of view. Such writing calls for a lot of introspection on the protagonist’s part. If this isn’t your character, it’s best, in my opinion, to avoid verse. Can you sustain the intensity required to write a novel this way? Sometimes writing in verse feels really natural. Other times the close-to-the-bone nature of poetry is hard to sustain. If you are someone who can knock off thousands of words at one sitting, verse novels are going to hurt. Word counts will more realistically be in the hundreds. Entire novels are usually under 20,000 words. Can each poem stand alone? Does each poem contribute to the whole? When I worked through my own verse novel, I kept a quilt in mind, treating each poem like its own square of fabric. Each patch had to be able to function separately while at the same time contribute to the whole. I trusted that if certain patterns and shades in my story quilt were repeated (think themes or story strands), eventually the inter-connectedness would surface–a much more organic approach than is normally taken with prose. Some scenes flow, some end abruptly. Some thoughts wander, some jab. Use this knowledge to your advantage in composing your poetry. Are there key phrases or words at the heart of your poem? Play with the way you arrange words on the page to determine what look best “speaks” the poem. Within your poem, group similar ideas as stanzas or allow key lines to stand alone. Because poetry is both visual and aural, let the structure of your work communicate to your reader your protagonist’s emotional state. Is she frightened? Think of how this feeling looks structurally (little punctuation? words tightly packed together?). Is he in a hurry? How can you express this on the page? You can also use specific types of poetry (sonnets, for example), as Pat Brisson did with her book, The Best and Hardest Thing. In writing about Sylvia Plath (Your Own, Sylvia), author Stephanie Hemphill chose to mirror several of Plath’s poems, giving her readers a sense of the poet’s style, subject matter, intensity, and character. A sample poem from May B.
clouds that skirt the sky. like the braids in a rag rug. and numbers go on forever. Verse novels aren’t books with strange line breaks. They are stories best communicated through the language, rhythm, imagery and structure of poetry. Don’t be afraid to experiment to see if your story might work within this unique genre. 1Much of the story is told through thought, not dialogue. We have a real sense of May’s internal life. 2Verse allows for the opportunity to play with language. Here’s a bit of rhyme. 4Poetry should be visual and figurative language fresh, even unexpected. 6The two stanzas mirror each other in appearance, reinforcing the visual aspect of experiencing poetry. 7Notice the poem is about place and uses measurements/counting as a way to make sense of things. The few trees and rabbits are a contrast to infinity. The poem fits into the overall story–May leaving for a new place–but can also stand alone as a poem about the short-grass Kansas prairie. 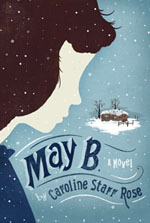 Caroline Starr Rose was named a Publishers Weekly Flying Start Author for her debut novel, May B., which was an ALA-ALSC Notable Children’s Book. 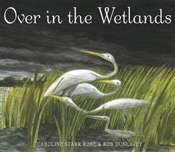 She is also the author of two books released this year, Blue Birds, and Over in the Wetlands: A Hurricane-On-The-Bayou Story. Caroline spent her childhood in the deserts of Saudi Arabia and New Mexico, camping by the Red Sea in one and eating red chile in the other. She has taught social studies and English, and worked to instill in her students a passion for books, an enthusiasm for experimenting with words, and a curiosity about the past. She lives in New Mexico. Visit her at www.carolinestarrrose.com. This article was originally published in the January 2012 issue of SouthWest Sage, and is reprinted here by permission of the author. I’m interested in learning more, thank you for sharing!